Butch/femme, avant-garde/H&M, underground/mainstream—the Liberian-American fashion designer Telfar Clemens taps antagonisms of style, disrupting fashion conventions with an aesthetic he terms “simplex” (simple + complex). If the measure of fashion is its making of the future—then TELFAR’s greatest accomplishment may be that after over ten years in fashion, the industry is still struggling to metabolize him. TELFAR’s reception as a brand is inseparable from Telfar Clemens as an individual. Positioning himself somewhere between a mascot and a decoy, he has increasingly appeared in his own advertisements—his biology and biography forming the DNA for his brand. In the images displayed here, photographed by Asger Carlsen, over twenty members of TELFAR’s family gather to model his garments. Their shared genetics become a narrative device, representing where he comes from in the most literal sense. Further extending this concept to retail a display, TELFAR has partnered with German mannequin studio Penther Forms in the production of mannequins of various genders and bodytypes—all made in his likeness, created by artist Frank Benson. 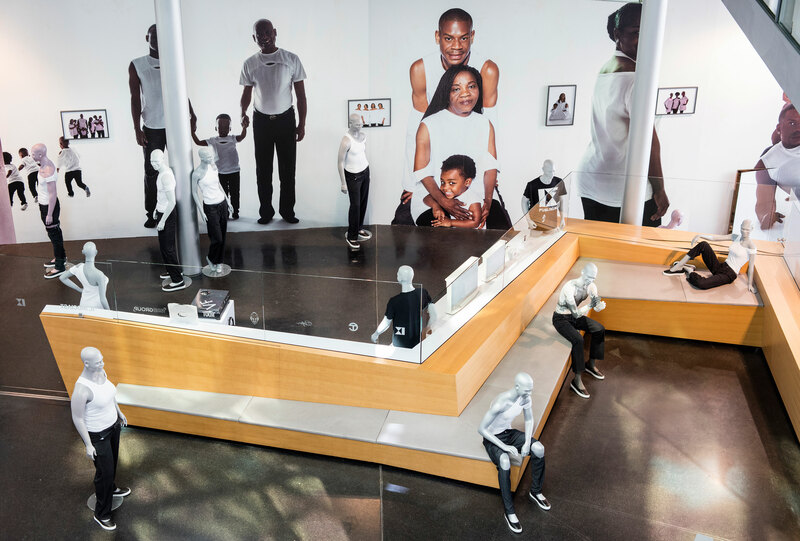 Shown on both the images and mannequins are a selection of thirteen garments ranging from 2005 to the present, all of which play with the idiom of the T-shirt while highlighting Telfar’s core ambivalence towards luxury. Individuality is another core contradiction of the TELFAR brand, and so for the 9th Berlin Biennale TELFAR has also designed the uniform worn by the exhibition guards. The ensemble consists of a mock-polo, TELFAR’s basic jeans, and his iconic basic shoe, a unisex ballet flat with a sneaker sole. The back of the polos bear the word “PERSONAL” — which refers to the German word for “staff” or the proper domain of individuality. TELFAR has also designed a uniform for visitors to the Biennale: a T-shirt based on the construction of the polo and a tote bag based on the construction of the T-shirt—both featuring the German word “PUBLIKUM” (roughly meaning “audience” or “public”). These are available for purchase at the TELFAR pop-up store at the Akademie der Künste and (selected items) at the KW Institute for Contemporary Art ticket counter.